Spring 2015. Too tall and lacking taper. Spring 2016. Trunk chopped back. Winter 2016. Trunk chopped further and first wiring completed. Fingers crossed for back budding to fill the gaps next year. First One of the Year, Bertie! 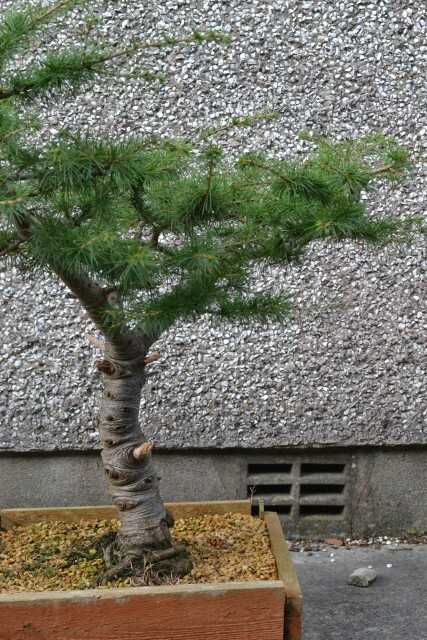 Well, Bertie, after you asked about the blog the other night, I feel properly motivated to kick start again after a longer than expected absence from bonsai related activities. I do apologise, Bertie (and others!) if you’ve been checking in and leaving disappointed. This is perhaps a good opportunity to give you readers some notice that for the month of July I may not be around much as my wife and I are expecting our fourth child! Anyway, here’s some progression pics of the Chinese juniper mentioned in one of the last posts and I did say I would post when styling was finished. Remember this pic I drew of what I had in mind? 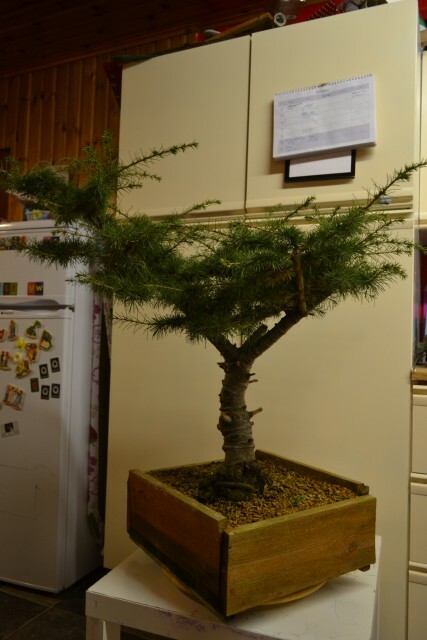 I bought this Cedar (Himalayan/Lebanon?) 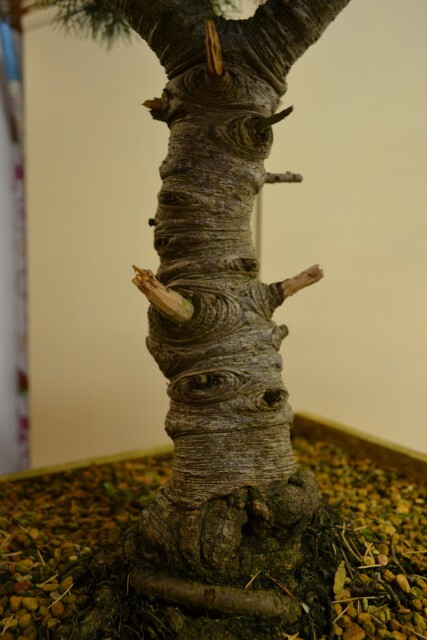 three years ago when not long starting out in bonsai. It was sitting in the corner of a run down garden centre in very poor health but I got it for less than half price and was prepared to take a gamble with it. The features that caught my eye were the heavy lower trunk and its peculiar old bark . Reminded me strangely of an elephant trunk! Since then while nursing it back to health I’ve become aware that there are many flaws with this piece of material but it remains useful for me to practise a range of skills on while I develop it. 1. Trying to make as compact and powerful a tree as possible. 2. There is more useable branching lower down on the short trunk that could be pulled down. 3. The taller trunk would take away from the unique, powerful lower half. 4. The movement of the lower trunk is to the right and using the shorter trunk would continue this movement smoothly. 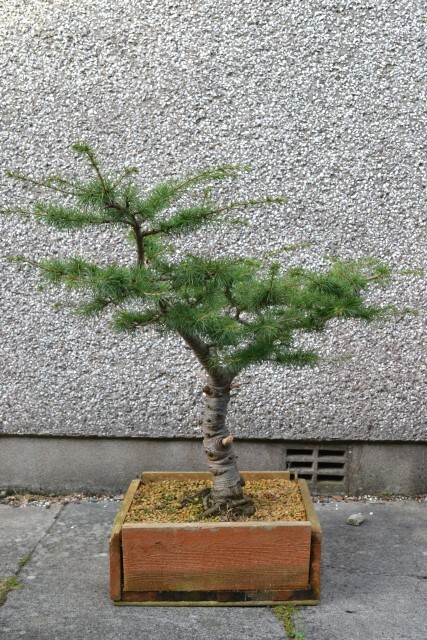 For right now, all I did was carry out some ‘pre-styling’ by cleaning out old needles, removing unnecessary buds and thinning out the foliage to allow more light in and allow me to see where branches could be placed when wiring in future. The tall trunk will be removed and a jin left that will be carved along with the stub of the third trunk removed 2 years ago.